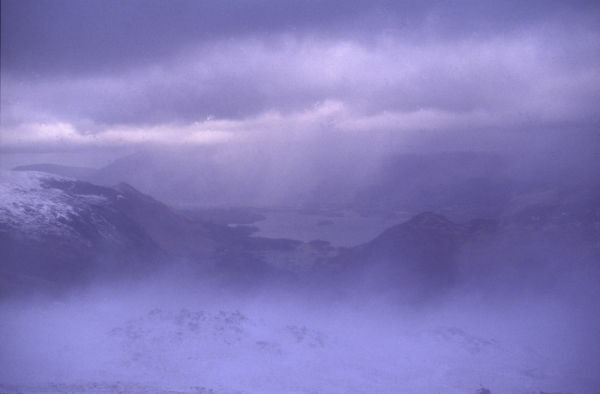 Ron and Maggie Tear Photography: Glaramara blizzard Lake District. Maggie is an accomplished hill walker(likes nothing more than getting her boots on) I just follow trying to keep up whilst taking photos on the way.This occasion we were on a winter mountain course thet was cancelled due to no snow.We awoke on day three of our planned stay to find it had snowed overnight! Our plan was to do the course on our own (just practice), on arriving on the summit of Glaramara we practiced our ice axe skills only to find ourselves in a blizzard(very exciting!). I specialise in inclement weather photography this opputunity was not to be missed.-13 and no one else in the hills perfect!